Wadasé visits the CPN Eagle Aviary in September. After being gone a little more than eight months, Wadasé Zhabwé is home. Maybe she got wind of the last article in the Hownikan about her lack of recent visits, and she had to be sure to make us change our next article at the last minute. Perhaps she came back because she knows we are about to release her “little brother,” the eaglet that hatched here this spring. Wadasé has always had impeccable timing like that. There are certainly many invaluable things that Wadasé could teach the young eaglet. Although he will have our support and be able to come and go from the enclosure where he hatched, he will not have the benefit of following his parents in the wild. Anyone with siblings knows how much we depend on them growing up, and how they challenge us in so many different ways than our parents ever could. Wadasé has flown over and perched high enough to keep an eye on him in his enclosure. The eaglet has been keyed up watching her too. Taking long circular flights around his enclosure when she flies nearby, he is ready to follow her. In less than a week, he’ll have that chance. After studying Wadasé’s telemetry, we know she came in at dusk on Aug. 28 to roost in the south pasture, just outside the aviary tree line. She has stayed within 1.5 miles of the aviary, visiting every morning and evening just like she never left. 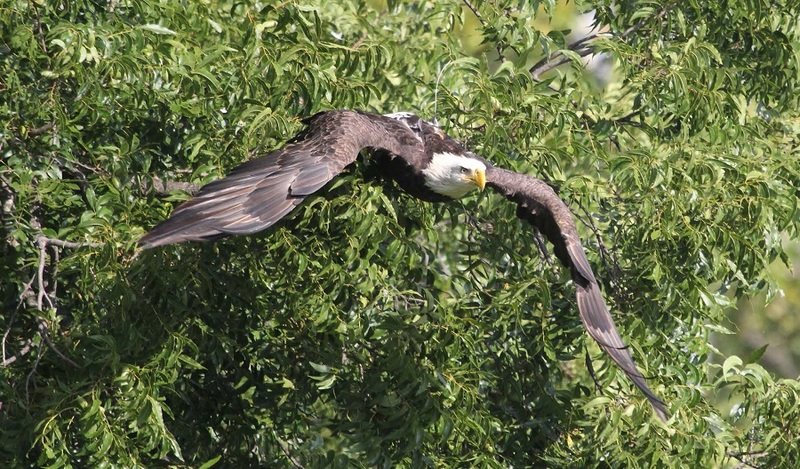 On Sept. 7 she took a short trip, stopping at nearby eagle nests in McLoud, Harrah and Jones along the North Canadian River before returning to the aviary the evening of Sept. 11. However, she didn’t come back alone. While we have no way knowing if it was merely coincidence or not, the morning of the 12th a male bald eagle came flying in from the river shortly behind her. He was the same male that spent time at the aviary in March earlier this year. Because he has such an exaggerated way of banking and turning in flight while hanging his feet down in midair as if he were landing, there’s no mistaking him for another eagle, even though he has molted well this year and his head and tail are almost completely white now. He made several passes above the aviary before making an awkward attempt to land in the tree where Wadasé was perched. After finding the perch he chose was not going to support him, he once again made wide circles around the pasture and as he passed by her, she vocalized but didn’t give chase. It was the first time she tolerated another eagle, male or female, entering her territory around the aviary. The young male eagle was persistent and kept trying out new perches, each closer than the one before. Eventually, he found a perch just a few feet above her where he could sit comfortably and keep an eye on Wadasé. They sat high in her pecan tree out front that way for several hours before she headed off to the east pasture and he headed for the river. We expect Wadasé to nest this year. With the change of seasons approaching, she is most likely already scouting for territory that would be suitable for a nest and looking for a mate to bring back to the spot she chooses. This male will be a good fit if she nests nearby because he already is very comfortable around the aviary. Although we have yet to see them perched side by side, we have to give him an A+ for effort and persistence as he continues to visit the aviary and Wadasé every day. As summer comes to an end, fall marks the beginning of many new challenges and changes for Wadasé and her “little brother” once he’s released. We look forward to sharing those stories with you. As always, we encourage you to keep your eyes out for Wadasé if you are near the areas she frequents. • Learn about the CPN Eagle Aviary and read Wadasé updates at potawatomi.org. 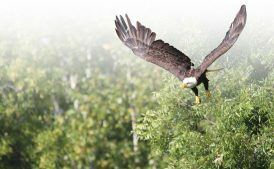 • Send your encounters with Wadasé or any other eagles in Oklahoma or wherever you may be to us at aviary@potawatomi.org.